Form on webpage is a powerful interface to interact with viewer and collects information. Input: It collects information. But don’t process information itself. Output: Output of form processor is either an email or input for another program. Form code starts with <FORM Form_Elements >, in-between “Form_Body_Tags” and ends with </FORM> tag. NAME: Form name for its identity. ACTION: Specifies destination where to send information for processing. METHOD: Specifies the method how the information will be sent. It is of two types “GET” and “POST”. Depends on destination program or function how it wants to receive the information. METHOD=”GET” or METHOD=”POST”. * Form information visible in browser address bar. Hence it is not fit for user authentication forms. * Sends only limited amount of information (256 bytes-1K) depending upon destination server. 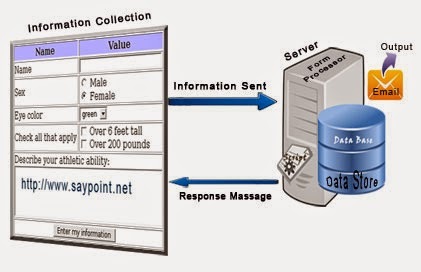 POST: This method sends form information in invisible way(within body of request). * Form information invisible to user so fit for user authentication forms. * Most commonly used method. * Most CGI programs are written to accept information with post method. It can send much more information than GET. It limit to 32K. ENCTYPE: Specifies the type of encryption use while sending information. <INPUT>: Creates single line input field. * NAME : unique tag name. * VALUE : predefined value for tag. # submit : Creates a Submit Button. After click sends form information to processing program. # password : Same as type=”text” but input character displayed as “*”. # checkbox : Creates check box. # radio : Creates radio button. # hidden : Creates hidden field to hide the information from user so that it may not change. Important: <FORM> element ENCTYPE=”multipart/form-data” is used when using file upload. # reset : Creates a Reset Button. After click reset form to starting stage. May not required “value” & “name” attribute. # button : Creates a clickable button with text you specify in the “value” attribute. Submit button may be optional. # image : Shows an image in place of submit button, on click act as “submit”. “src” attribute must be used to specify image address. All attributes of <img> HTML tag optionally may be used like-“align”, “border”, “height”, “width”, “hspace”, and “vspace”. * SIZE : Specify the size of the text input area. * MAXLENGTH : Specify max number of characters that may be typed into the input area. * PLACEHOLDER : A short hint showing expected value in field. * ACCEPT : used only with “file” attribute. * SRC : used only with “image” attribute. <SELECT> : Creates drop down and menu box. <TEXTAREA> : Creates a multiline text area. NAME : Unique tag name. ROWS : Specifies the number of visible lines of text. COLS : Specifies the visible width of the text area.